Please refer to our stock # CJ0069 when inquiring. 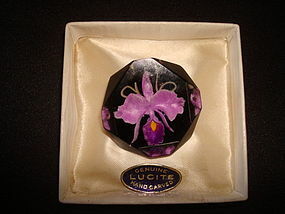 Wonderful Lucite pin from 1950's featuring a carved orchid with it's original box!!! This pin is in fine condition and measures 1 3/8 in length x 1 3/8" wide. This one is a real beauty!! !